Students will create their own 3D printed characters and stories and learn about design elements. Explain to students that they will be creating their own stop motion video stories. 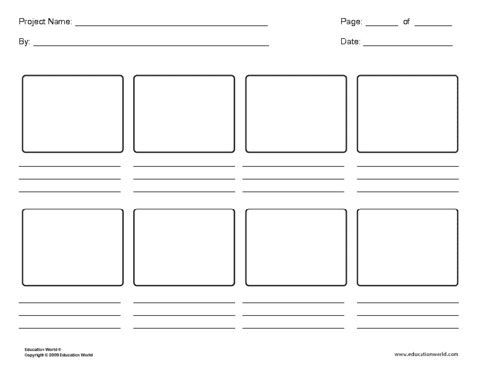 In order to create their stories, they will need to first brainstorm and storyboard their story. Topics of the story can be anything you choose, or let your students choose. This can be a reaction to a story you are reading in class, a free write of a student, a continuation of a story students have read; let your and your students creativity run wild! Be sure to explain that their story should be relatively short (30-60 seconds). This will be important because of the length of time it will take to record their stories. After your students have brainstormed their story, then have them write the story. Remind students that these will be video stories, so they should not rely heavily on narration, and should have more dialog. When student's have completed their stories, have them engage in the editing process - self edit, peer edit, teacher edit. Once stories are edited and completed, students can begin to storyboard their videos. Once the writing process is complete, students can begin to create their background, props, and characters for their story. Please note:You will need access to a 3D printer for this part of the process. It is important to explain to students design elements when creating their background, props, and characters. Explain to students the importance of scale and depth when creating the visual representation of their stories. When students are creating their projects, students need to consider what it will look like on film, and how they expect their characters and props to interact on the background. Demonstrate for students on a background that you create together, how they can account for scale and depth of their creations. Background: Students can use any variety of art supplies; such as construction paper, boxes, drawings, paintings, etc. Allow students to engage their creativity, but limit the size of their backgrounds to 8.5 " x 11 " (standard paper size), to help with the video portion of the lesson. Props:Students can create their own props using art supplies, or they can also use the 3D software to create props. Using the stop motion studio app and their storyboard, have students create their stop motion videos. Explain to students that they will be creating their videos using the Stop Motion Studio App. This app will allow them to create the look of their objects moving, by taking still images and linking them in sequence into a video. Stop motion video shot at a rate of 10 frames per second, look the most smooth to the human eye. Because of this, in order to create a 30 second video, a student will need 300 photos of their story. Keep this in mind if you are requiring a length of the story. Note: I recommend using a locker stand to aid in filming your students stop motion videos. The iPad can be placed on top of the stand and the background, props, and characters can be placed and manipulated below. Have students share their videos with one another in class, when students are sharing their videos, have others take notes on what they liked and what they would change about each video/story. When videos are complete, upload them to a video sharing site of your choice. Share with the world on Twitter, Facebook, or your personal classroom website or blog. This gives the students an your classroom to have an authentic audience for their videos.